The AONN+ certification is different because it focuses more on the patients. It focuses on the resources you can give patients and the understanding of what it takes to be a patient navigator. A lot of other certifications are more like standardized testing and just understanding words and theories and not really understanding one-on-one patient encounters. 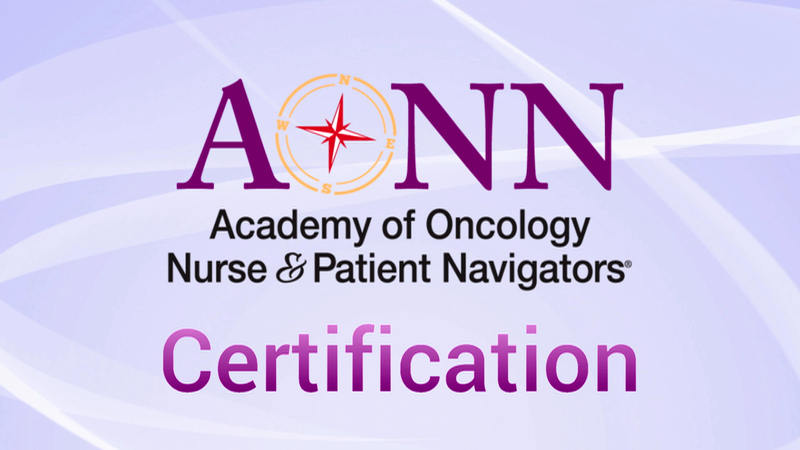 "Last week I received my notice from AONN+ that I passed the first certification exam for Oncology Nurse Navigator Certified Generalist (ONN-CG). I immediately added this to my signature line and smiled – a lot! When I look at this new addition I know it doesn’t automatically make me a better Nurse Navigator, rather it inspires me to uphold the standards (and knowledge) expressed and queried in this first national exam and I feel a true fellowship to navigators all across the country. I am grateful to AONN+ and those who assiduously constructed this exam to provide a tangible national standard for us to aspire to as we each guide our patients and loved ones through the formidable labyrinth of their cancer diagnosis and treatment. You have taken what was a concept and shaped it into a world where the highest quality education for patient navigation is available. I feel like we in AONN+ are all part of an amazing phenomena where history is being made by us, as nurses, carving out a new path for our colleagues to come." "If you’re a nurse navigator, you’re working in this great field, we have to be certified. We have to show that we have unity, that we have a purpose, that there is a mission, and AONN+ does that for us."